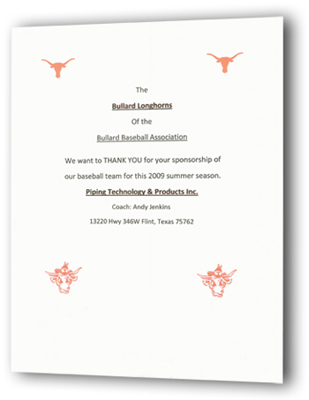 Piping Technology & Products, Inc. is a Proud Sponsor of the Bullard Baseball Association | Piping Technology & Products, Inc.
PT&P is happy to support The Bullard Longhorns of the Bullard Baseball Association in their summer season of 2009. 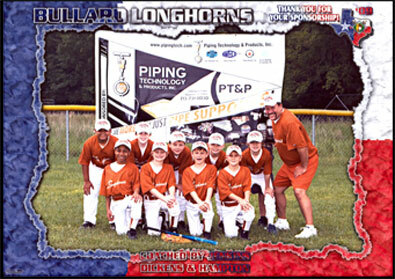 The Bullard Longhorns play in the division for 9-10 year-olds in Smith County. For more information on the schedules and game locations, you can visit their website. We wish them the best of luck and hope for a great season.